There is also strong decadal variability in the Pacific Ocean, part of which is the Pacific Decadal Oscillation (PDO) (see the figure, panel B). The PDO is closely related to the Interdecadal Pacific Oscillation (IPO) but has more of a Northern Hemisphere focus. Observations and models show that the PDO is a key player in the two recent hiatus periods (2). Major changes in trade-winds, sea-level pressure, sea level, rainfall, and storm locations throughout the Pacific and Pacific-rim countries extend into the southern oceans and across the Arctic into the Atlantic (7–9). The wind changes alter ocean currents, ocean convection, and overturning, for example affecting the Atlantic Meridional Overturning Circulation (10). As a result, more heat is sequestered in the deep ocean during the negative phase of the PDO (1, 6, 9, 11, 12). GMST therefore increases during the positive phase of the PDO but stagnates during its negative phase (see the figure) (13). 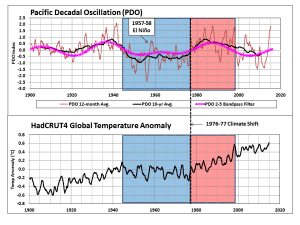 The figure below is adapted from the one on Nate Mantua's website, and shows the typical patterns in the North Pacific for the two different phases of the PDO during the northern hemisphere winter. David Middleton is a signed on science denier. He'll deny anything and everything on a whim. One time he decided to dispute some science about lizards, triumphantly producing some that he claimed countered the science. Problem was he had the wrong lizards! And the odd thing was that he could have used the findings to argue that (some) animals can survive climate change. The paper was about how lizards had found a niche that enabled them to survive 20 million years of changing climates. This time he's arguing with experts about the Pacific Decadal Oscillation. He provides scant evidence for his claims. Mostly what he does is copy and paste some bits and pieces from an article at Climate Central and prance about saying that they are wrong. “Unprecedented warming spurt”… When? Where? Then he put up a chart, not of surface temperatures but of the lower troposphere. Dimwit. Firstly, the Pacific Decadal Oscillation doesn’t drive anything; so it could not be “playing a role in record-breaking warmth.” The PDO, particularly its long-term behavior is a response to, not a cause of warming and cooling cycles (quasi-periodic fluctuations). The late 20th century warming phase was coincident with PDO phase reversals. He might as well say that ENSO doesn't drive anything, that El Nino and La Nina are just responses not causes of warming and cooling cycles. I bet Bob Tisdale would love that. Figure 5 | Cold PDO phases have a blue background; warm phases are red. Credit: Essay by Kevin Trenburth, "Has there been a hiatus?," which was published in Science in August, as posted at Climate Central. You can see why Dr Trenberth might speculate that there's been a phase shift. It's spurted way up above any year in the previous warm phase. David Middleton put up a dinky little chart that was so small it was illegible, and it clearly didn't have the 2015 surface temperature (compare with Figures 1 and 4 above). PDO (University of Washington JISAO) and HadCRUT4 (Hadley Centre). The current upswing in the PDO is more analogous to the mid-cycle 1957-58 El Niño than it is to the 1976-77 Climate Shift of the Pacific Ocean. That's a joke, right? He wants to wait for a ten year average to see if there's been a phase shift. Well, that might confirm one well after the event, but it certainly doesn't mean there's not been a shift already. The ten year mean taken today would comprise mostly the cool phase, so it's not much use in this case. It's true that swings have happened within a period without a complete shift to the opposite phase. However to say that large swings are not uncommon is an exaggeration. The only time there was a large swing opposite to the phase was way back in 1933, and the "large" bit was only one year, not two. As for the time in the 1950's - that's probably fair comment, although the index didn't get as high as it has the past two years. What is true is that only time will tell whether this is an extended warm phase or a short term blip. Remember how David said that this year is "more analogous to the mid-cycle 1957-58 El Niño than it is to the 1976-77 Climate Shift of the Pacific Ocean"? Let's check. Look at the PDO index in values for 2014 and 2015 and see if they look like the values in the "mid-cycle 1957-58". Since Figure 7 is so scrunched up, look at the data in Figure 6 above it. They don't, do they. The highest yearly average in the 1950s was 1.03 in 1958. In 2014 it averaged 1.13 and last year, 2015 it average 1.57. It hasn't been negative now for 23 months, not since February 2014. It was also positive from May 1957 to June 1960 except for one month, but was above one for only fourteen of those months. By contrast, since February 2014, there have already been 17 months where the index has been above one, and four months where it was higher than two. (It didn't rise above two at all in the 1950s.) This year the average was higher than that of any year in the previous warm phase from 1976 to 1998. Now that doesn't mean that the index will stay positive or that this really is a shift in phase. Although the index is based on sea surface temperature, the PDO itself is associated with much more than temperature. It's also about how the wind behaves, and pressure gradients etc. And there are likely various teleconnections beyond the north Pacific. David Middleton obviously couldn't bring himself to say that he tended to agree with Michael Mann's speculation. That would be a step too far for a climate science denier. Thing is, as the scientists have pointed out, if there is a shift to the warm phase of the PDO, or a shift to more El Ninos than La Ninas, then the global mean surface temperature would be likely to rise more quickly in the near term. Deniers are a funny bunch. Some of them have an allergic reaction to climate science. John Francis can't bear it that the last two years have been the hottest on record. He quits altogether when he sees mention of a real climate scientist. Whenever we see the word “unprecedented” we know a load of nonsense will be forthcoming. and then we see the dreaded name Trenberth, and stop reading altogether. It just doesn’t drive any of them. cause and effect are a slippery slope. is it short days and long nights that cause winter, or is it the height of the sun in the sky, or is it the tilt of the earth’s axis with respect to its orbit around the sun? The ‘pause’ is our greatest weapon. I sure home the PDO does not bring a warming spike. First Bob Tisdale tells us El Niño has peaked and now this .. oh my. Your article in 2008 indicated that you predicted a 30 year cooling of the PDO. Does this prediction still stand? Yes. I made this prediction in 2000, based on a continuing pattern of PDO 60-year cycles (~30 yrs warm, ~30 yrs cool). In 1977, the PDO flipped from cool (where it had been from ~1945 to 1977), to warm in a single year, and we had global warming from 1978 to 1998. In 1999, when the PDO flipped back to cool, I projected the long-term PDO pattern into the future and predicted ~25-30 years of global cooling. The global climate has followed the PDO for the past century and glaciers have advanced and retreated accordingly. But the pattern apparently goes back even farther (500 years)–I plotted the oxygen isotope ratios back to 1480 AD using the accelerator data of Stuiver and Grootes and found 40 such oscillations, averaging 27 years long. So far, my prediction seems to be holding. The climate has cooled slightly over the past decade and we have had no warming for 18 years. Time will tell if the cycle continues for another couple of decades. All indications are that it will. We’re just entering a Grand Solar Minimum, which, in the past, has correlated very well with climate. No, Don, the climate has warmed this past decade, it hasn't cooled. Fifteen of the hottest years ever recorded in the instrumental era have been since (and including) 2001. Last year and this are the two hottest years on record. And the PDO doesn't swing in a regular pattern. It's not been 30 years warm and 30 years cool ever as far as I know. Well, the very latest is the December number for the PDO index is in at 1.01, up from November's .86. From its negative phase, I think it's a little unusual to shoot up the way it has and have it not be a shift to a positive phase. It hit 2.51 in December 2014. I think the highest ever is 2.83. I'm old and a bit bewildered but my wife is a barrister (trial lawyer in the US) and she assures me that evidence matters. I don't think it does. I think she's just talking up the value of evidence for personal gain. What a great article! I like how these so-called ‘experts’ used by this denier site pick and choose what they claim is their ‘evidence’. You’ve done a great job exposing them. Wow! Now that’s a “Whopper”! It’s perfectly clear that reality (the real world) fails to register upon deniers, no matter what the real evidence actually proves. Makes you wonder what kind of lala land they occupy. Certainly not this one. You saved the best bit for last - Denier Don's "The climate has cooled slightly over the past decade". The denial is getting desperate: perhaps we should call him Desperate Denier Don from now on. I don't care if he's 80, Easterbrook is an embarrassment to emeritus professors. "I don't care if he's 80, Easterbrook is an embarrassment to emeritus professors." Clever that Watts calls internet commenters "peer review" to confuse the reality of actual scientific peer review. I believe the latter can actually stop publication of something, which is a pretty big difference between site comments and peer review. You are going to have treat with this week's "Friday (never) funny". It is truly a declaration of faith, and there is one commenter there who claims to have done a thesis on extracting temps from the satellite data in the 1970's. Hmm... considering that the UAH record was not developed until 15 years later or so, one might tend to doubt his claims. Please, please, please disembowel this post and this person's claims. That's even after a run of hottest years ever in the modern temperature record. Will the concept of noise superimposed on signal ever diffuse through the skulls of the Denialati? That's two whole years of pause that have somehow 'unpaused' themselves. So we have a new discipline of pausal kinematics to be studied and, presumably, published in a dog astrology journal. Converging multiple lines of evidence implying causation never stopped tobacco denying shills like Singer before, do you think consilience will stop Singer and his buddies now in the climate area? The IPCC AR5 report states AGW due to greenhouse gases is running at over 100%. This implies there is some cooling going on. If the cooling was due to the phase of the PDO and not to aerosols, then we will be in for a long period of warming over and above the usual global warming. I've been saying just that at Climate Etc. for quite awhile. Yes, that looks like the striking conclusion of Fig 5. The cool phase of the PDO was its golden age, and we still got COP21. Not much of a record really.